At its large hotels, St. Lucia is much like other Caribbean islands. What makes the island so special, in our view, is its rugged terrain, interesting history, beautiful climate and delightful people. Together, they offer a compelling glimpse of what the Caribbean 'used to be': physically riveting and spiritually renewing. We are not a "luxury five-star" accommodation. Brigand Hill is peaceful and informal - but close to well-known tourist venues like Marigot Bay, Anse Chastenet and the major towns. Come here to relax and enjoy nature. 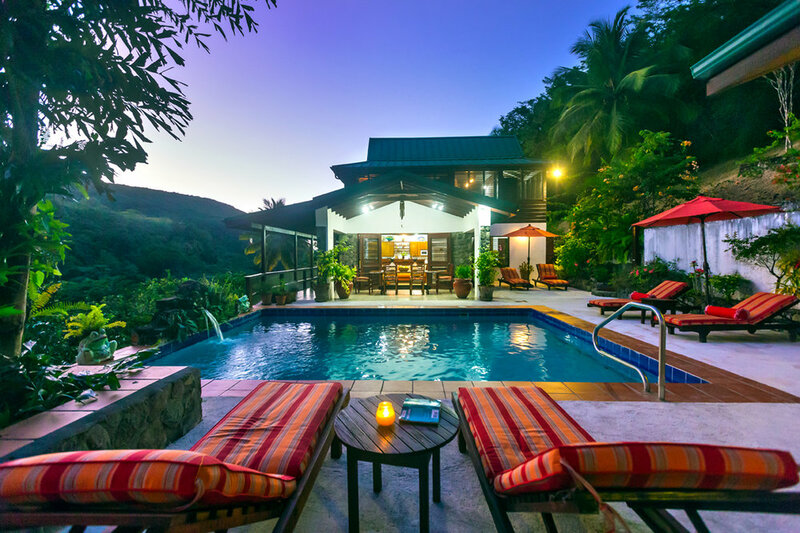 Our vision for Brigand Hill ~ close to nature, close enough to everything else ~ has been to celebrate what makes St. Lucia so unique, its verdant mountains, beautiful rain forest, uncrowded beaches, healthy food and calming lifestyle, and thus to offer our guests an experience from which they emerge refreshed and eager to return. We hope to welcome you to Brigand Hill soon! Brigand Hill sits on a ridge overlooking a former banana plantation. To the East, you have the rugged mountains that help make St Lucia's landscape so dramatic - to the West, you have the Caribbean Sea and its crystal blue waters (visible from most parts of the house), as well as our private beach. The home is on the West Coast, just off the main road that travels between the north and south. There is very little development on the east coast - most, if not all, of the island's hotels and sightseeing areas are on the west coast and a reasonable drive from Brigand Hill. It is close to everything you'd want to do, while still affording you privacy and a sense of intimacy with the island. A local fishing village sits just north of the home, about 5 minutes away, and a popular hotel (Tikaye Resort) is about 5 minutes south. The Pitons, in the town of Soufriere, along with the Sulphur Springs and the drive-in Volcano are about 30 minutes south. Deep-sea fishing charters are 30 minutes north. You'll probably want to rent a car if you want to explore the island. Our villa manager, George, owns a large van for guest rental at below market rates. He can also act as your island tour guide/chauffeur for the week and do airport pickup/dropoff, all included in the rate (which ranges from $350-$450 per week depending on party size). This is well below prevailing island rates. Brigand Hill maintains a full time staff that includes a cook ( Bertilla), maid ( Vera) as well as our villa manager, George. Guests say Bertilla's cooking rivals that of the major restaurants on the island and we highly recommend planning several meals with her. Vera will make sure your bed is made every morning and clothes are washed and folded. You don't have to raise a finger; let them pamper you! A week at Brigand Hill can be anything you want; full of vigorous activities such as mountain biking, Piton climbing, scuba diving and hiking. Some guests prefer a week of reading good books, lounging by the pool, napping and sampling the superb Caribbean cooking of our staff, even discovering new fruits and vegetables—in addition to the familiar plantain, avocados, mango, yams, and pineapple. Brigand Hill has a main building with 3 bedrooms ( two queens and 1 twin set) as well as 3 full bathrooms--all with skylights-- a living room, outdoor dining room, two outdoor showers, a wrap around deck overlooking the canopy and rainforest to the East, and the Caribbean Sea to the West. We have a separate " cabana" just off the pool that includes two more bedrooms ( one queen, one twin set) and another full bathroom with his and her sinks. Guests have access to the entire home and all its amenities, including our private beach. Easy access either by walking down the driveway or drive down with all of your necessary items for the perfect beach day-- i.e. cooler, drinks, food. Snorkeling is great just off the beach, so make sure to enjoy our complimentary snorkel gear. Just ask our villa manager, George. Owner of the villa lives in the US most of the year, but is always available by phone or by email should the need arise. George, our villa manager, lives on premises; he is a great guy and a jack of all trades, so don't hesitate to pick his brain regarding history of the island, things to do, where to go. He can also help plan daily excursions and act as your tour guide and show you around the island.